The vacation is over. Well, it sure felt like it. The Rangers had the week off until this weekend. Oh. They practiced a lot. When you lose five of six including two brutal performances in back-to-back losses at Montreal and home against Winnipeg, it’s expected. Coach David Quinn isn’t running a country club. So, the team spent plenty of time working on correcting the mistakes that crept into their game following Thanksgiving. When they play for the first time since last Sunday at the Panthers, let’s see how they respond. Will the good work habits the Garden Faithful got used to return? That is the question as the 13-12-3 Blueshirts enter tonight’s match in Florida. Their spirit should be warmer at least. Especially given the cold 30 degree temperatures we’re having as old man winter takes over soon. On my birthday no less, at least it’s sunny outside. That suits me just fine. Can the team get a win for me? It would be nice. What also would be nice is a victory on the road. Wins away from MSG have been tough to come by this season. The Rangers are a dismal 3-8-2 on the road. In fact, they haven’t won away from The Garden since a 5-4 shootout win at Columbus on Nov. 10. All three of their road wins have come in the shootout. They also beat the Sharks and Ducks. Since 11/10, they’re 0-4-0 on the road having been outscored 19-7 in regulation losses at the Islanders (5-7), Flyers (0-4), Senators (0-3), and the Canadiens (2-5). A 12-2 combined score in the last three defeats that saw them get shutout twice is discouraging along with the usual clunker at the House of Horrors. Maybe the Dads being on the road trip can bring them some luck. It did in one cool aspect. With the Eastern leading Lightning on Monday night, it’ll only get harder. That isn’t to say the Panthers will be an easy opponent later. An unpredictable team that comes in 11-11-5 with a disappointing 27 points that’s tied with the Senators for last in the Atlantic, Florida is capable of scoring goals in bunches due to the talent of Alexander Barkov, Evgenii Dadonov, Jonathan Huberdeau and impressive former Senator Mike Hoffman. Even without the injured Vincent Trocheck, they boast plenty of skilled skaters who can be dangerous. Throw in blueliners Keith Yandle and Aaron Ekblad and you have some balance that can be lethal on odd-man rushes and the power play. The Blueshirts want to stay away from a run and gun game with the Cats. They also don’t want to take unnecessary penalties like the foolish one Brendan Smith took at the start of the third period to set Winnipeg’s explosive comeback from three goals down in motion last Sunday. Smith will likely be in the press box with Brady Skjei returning to the lineup following a one game benching. He’s expected to pair with Tony DeAngelo. That would mean the usual with Marc Staal and Neal Pionk along with Fredrik Claesson and Kevin Shattenkirk, who for some reason can’t escape the third pair. I understand that Claesson has been a good fit with him, but I’d like to see Quinn try Shattenkirk with Skjei at some point. Adam McQuaid practiced this week. He’s close to returning, which would give Quinn another option. For tonight, Quinn is gonna try Ryan Strome as the second line center, moving Kevin Hayes to the right wing on a line with Mika Zibanejad and Chris Kreider. If it works, that combines their top three forwards. Hayes has been used on the wing before with mixed results. Strome will center Jimmy Vesey and Filip Chytil. Vladislav Namestnikov returns and will play with Brett Howden and Jesper Fast. Working on the fourth line will be Steven Fogarty with Lias Andersson and Matt Beleskey. Mats Zuccarello has decided to hold off on returning. He wants to play it safe after coming back too soon twice in losses at the Isles and Flyers. Groin injuries can be tricky. Maybe he’ll suit up on Monday. Pavel Buchnevich isn’t ready quite yet. He didn’t make the trip. That’s too bad. They definitely miss him. Hopefully when the team returns home for Arizona next Friday, he’ll be back. Henrik Lundqvist makes the start against Roberto Luongo. The two active leaders in wins. Lundqvist has won nine games with a 2.63 goals-against-average (GAA) and .921 save percentage despite seeing the most shots against in his career. He’s up to 440 wins, ranking seventh all-time on the career wins list. He needs five more to tie Terry Sawchuk. Luongo comes in with five wins in 11 starts due to injuries. He’s got a 2.85 GAA with a .911 save percentage and one shutout in a 33-save win against Boston on Dec. 4. Luongo ranks fourth all-time with 476 career wins. That trails only Ed Belfour (484), Patrick Roy (551) and all-time leader Martin Brodeur (691). Keep an eye on Mike Matheson. Following a slow start, he’s got points in each of his last four games. The overlooked young defenseman is up to 13 points (2-11-13). He doesn’t get the notoriety of Yandle (leads D with 21 assists and 25 points) or Ekblad (leads D with 5 goals), but is a good skating defenseman that also must be paid close attention to. Basically, despite being a tire fire at even strength, the Panthers boast the kind of skilled blueliners I wish the Rangers had. They don’t lack talent. Barkov has yet to explode. Dadonov is very good. Huberdeau remains one of the most overlooked playmaking forwards in the game. His 24 helpers and 31 points lead the Cats. Prior to the previous game when he was held off the score sheet, Huberdeau had six posted six straight multiple point games, going 3-11-14. He is a terrific passer, who’s lethal in transition. Ask the Devils. They’re not getting consistent secondary scoring. Nick Bjugstad is a disappointment with just four goals in 27 contests. Jarred McCann has 10 points and Troy Brouwer has six goals with none in the past seven. Frank Vatrano has been productive with eight markers. Colton Sceviour has seven points and is a plus-four on a roster of minuses. Basically, play the Panthers five-on-five and limit mistakes that can fuel their transition. If the Rangers can do that, they’ll win for the first time in regulation on the road. 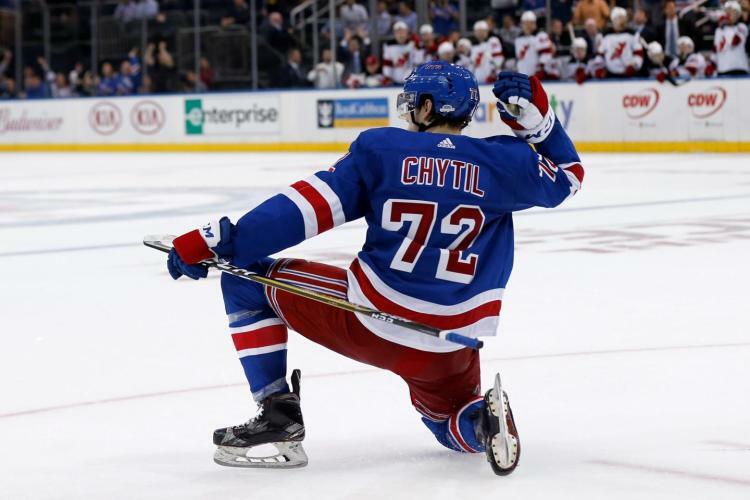 This entry was posted in Game Preview, NYRangers and tagged Aaron Ekblad, Adam McQuaid, Alexander Barkov, Brady Skjei, Chris Kreider, David Quinn, Evgenii Dadonov, Filip Chytil, Game Preview, Henrik Lundqvist, Jimmy Vesey, Jonathan Huberdeau, Keith Yandle, Kevin Hayes, Kevin Shattenkirk, Mats Zuccarello, Mika Zibanejad, Mike Hoffman, Mike Matheson, Panthers, Pavel Buchnevich, Rangers, Roberto Luongo, Ryan Strome, Vladislav Namestnikov. Bookmark the permalink.